For many years we have been researching our own family histories. Most of our ancestors have lived in areas often a long way from where we were living. We realised that having local information about these areas would be very helpful so we decided to make a local history web site our retirement project. Why Gatehouse of Fleet ? Margaret's paternal grandfather's family are from Dumfries & Galloway. Her grandparents James Hunter and Elizabeth Nicol both moved to Gatehouse in the 1890's to work for the Cally Estate, James as an estate joiner and clerk of works, Elizabeth as a nurse at Cally House. James and Elizabeth's son, Arthur Hunter lived in Gatehouse most of his life, running a joiner's business. Margaret spent all her young life with her parents Arthur and Nancy, attending Gatehouse School and Kirkcudbright Academy. 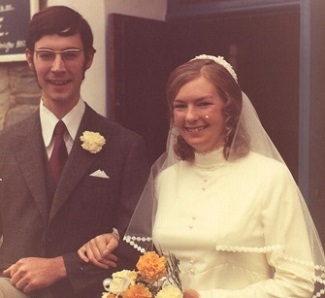 We were married in Gatehouse in 1972. 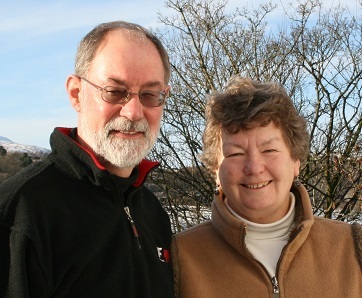 Graham's parents, Audrey & Des Wright from Nottinghamshire, retired to Gatehouse in 1982 and lived here until 1996, so continuing our connection with the town, after Margaret's parents had died. We have lived in several different places during our married life but always returned to Gatehouse for holidays. We retired to Gatehouse in 2006.